Dr Marie Coleman is a Senior Lecturer in modern Irish history at Queen’s University Belfast. Her publications include County Longford and the Irish Revolution, 1910-1923 (2003), The Irish Sweep: A history of the Irish hospitals sweepstake, 1916-1923 (2009) and The Irish revolution, 1916-1923 (2013). Her current research project looks at the experience of revolutionary veterans in independent Ireland. She is also involved in a number of projects to commemorate the centenary of Ireland’s involvement in the First World War and of the campaign for Irish independence. 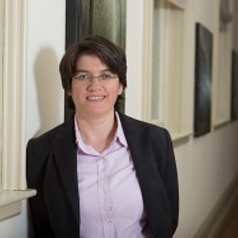 She is the Principal Investigator on the AHRC-funded projects ‘Northern Ireland’s 2016: Towards the contested commemoration of the Easter Rising and the Battle of the Somme’ and ‘Commemorating Partition and Civil Wars in Ireland, 2020-2023’, and was a co-investigator on the AHRC and BBC project ‘The First World War at Home’.